I made two bags! Oh my goodness, these were so fun to make. Working on something other than a quilt is like taking a short holiday for me. A change is good and although this isn't my first foray into bag making, I did learn some new skills. And there is still so much more that I would like to learn. 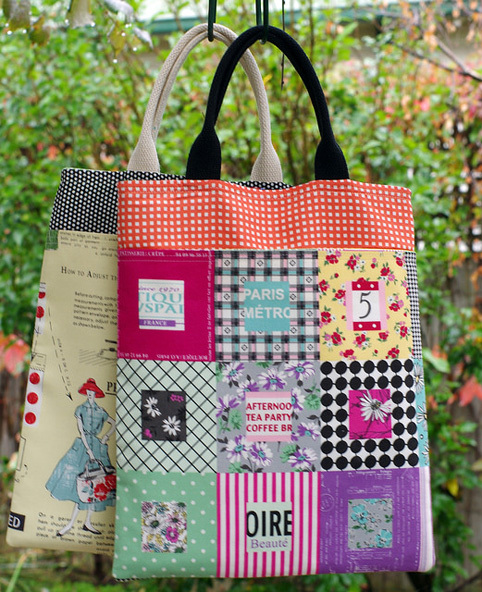 This bag pattern is a free tutorial by Svetlana (s.o.t.a.k. 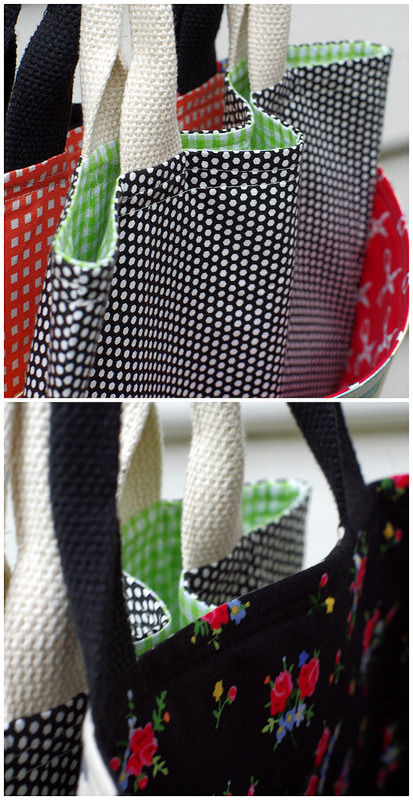 handmade) and is called Pretty Little Tote. Svetlana is an incredible patchworker, quilter, and sewist. A visit there is highly recommended! The tutorial was easy to follow and the pattern is simple - even suitable for a beginner. I happened to have all of the material requirements on hand, including the webbing for the handles, and whipped up both bags in one evening of fearless sewing. For me the most time consuming part was choosing the fabrics! 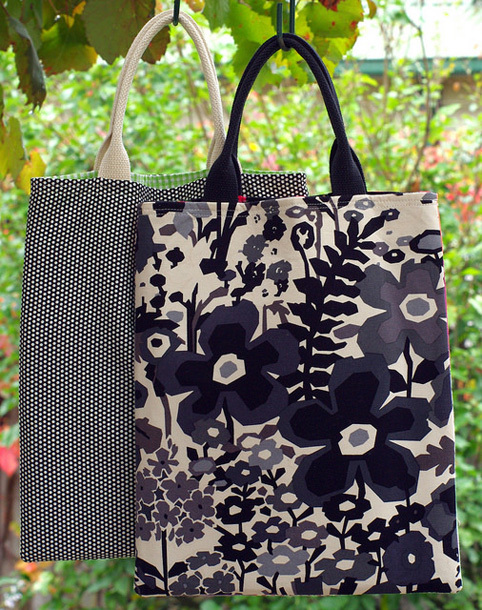 For the front pocket of the bags I have used beautiful Japanese fabrics by Suzuko Koseki and for the back of the bags I have used a simple black dot fabric (quilting weight) for one bag and a heavier (home decor) weight fabric for the other. The floral home decor fabric is by Alexander Henry (Keely in Black Tea). The inside of a bag also deserves a beautiful treatment and therefore I have used a green gingham and a black floral fabric, both are quilting cottons. I am not convinced that such a dark color for the inside of a bag is practical - it is dark in there - but I love that pretty bouquet print! (by Pam Kitty Morning). Even the inside of the front pockets are pretty! The yellow text fabric is also a Japanese import fabric by Suzuko Koseki. 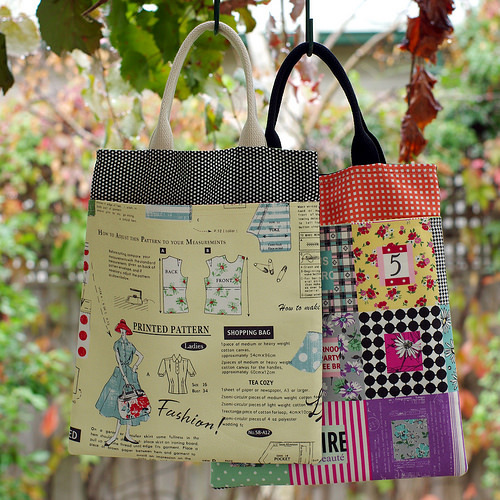 Thank you Svetlana for sharing the details of your pretty totes, and for the time you have taken to write the tutorial. You're inspired me to step outside of my stitching comfort zone, to learn and to experiment, and I had the most wonderful time doing so. Very lovely bags and thank you for the link to the tutorial. Thanks for the tutorial.. really nice! 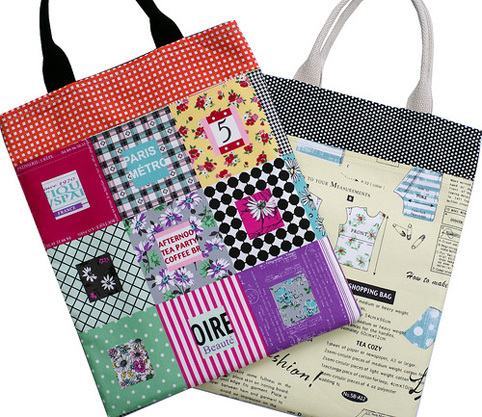 Lovely bags, makes me itch to go make a couple. Thanks for the link. What a great share! 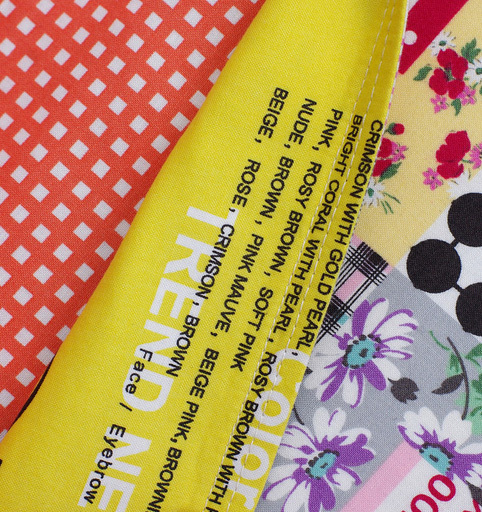 And the fabrics, both yours and Svelana's are eye candy, too. The totes are great! Thanks again for the giveaway for the gift card at Southern Fabrics. My comment was "someone is going to have fun spending that $75.00 gift card" and it turns out I won so I will having some fun! I am so excited and will post my purchase on my blog giving kudos to both Red Pepper and Southern Fabric! very pretty indeed. It is so nice to see how supportive the sewing community is. Just love your totes,both quilted and plain ones! Great for using up some of those stash scraps we all have. Love the fabric choices! It's always the hardest part for me, choosing the fabric. I'm a fan of svetlana's blog, too.. I love the patchy front to the bag. Great tutorial, Svetlana! very pretty, simple Bags are good for lern and experiments.